I’ve been reading some tweets about people’s general feelings on BFZ over the past few days and it seems like one of the biggest complaints people have about the set is that the cards are too wordy. Too much flavor on the card, too many directions, etc. The bottom line is that all of these words lead to a complex format. But is it TOO complex? Does Wizards want to make it harder to solve the format and make it difficult to find a clear cut, powerful color combination for limited? I can see the merits behind wanting to let the players discover all of these hidden synergies, but at the same time too much can be detrimental and lead to disinterest. Maybe you don’t agree with me now, but wait until we go through the set and then tell me what you think. One of the best things blue has going for it is the large amount of Awaken spells it has. On their own most of these cards’ abilities wouldn’t be enough to see play in sealed or draft, but when you throw in their ability + a 3/3 or bigger Land creature, suddenly it makes playing a slower tempo deck worth it. Take Coastal Discovery for instance. It’s a worse Divination at 4 mana, but if you pay 2 more you get Divination + a 4/4 creature. Would you pay 6 mana for a 4/4 creature that says “draw 2 cards when it comes into play”?? Hell yes you would. I don’t think it will be a high pick in draft, but in a slower Awakening deck with lots of removal and great tempo effects, it could be good. Better in draft if you can get cards to supplement it, but playable in sealed as well. Again, not a great card by itself and not the kind of removal you want (unless you’re playing an aggressive deck. Maybe blue/white flyers? ), but ask yourself one more time, would you pay 4 mana for a 3/3 creature that says “tap creature for 2 turns”? I think the answer would still be yes, but it wouldn’t be as good as the first spell as Coastal Discovery up above. If you’re looking for more cards for an Awakening deck then it’s good, but otherwise Rush of Ice is probably one of those cards that can sneak in as the 22nd or 23rd choice of your limited deck, especially if you’re running low on removal/tempo cards. 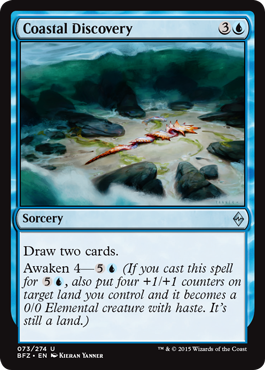 As far as blue removal/Awaken spells go, Clutch of Currents is probably the most playable. You get a bounce effect for one mana which isn’t bad when timed right, even if it is sorcery speed, but later on it’s bounce plus a 3/3 creature which can be a pretty big tempo swing. It’s like playing an Aether Adept (M12) except you can use it’s ability for one mana or pay 5 mana to use the ability and play the creature. Kind of like Evoke. So yeah, Clutch can be pretty good in clutch situtations ^_^. I think it will be played quite a bit in blue decks. Good both in sealed or draft. Halimar Tidecaller could quite possibly be a game-ender in a UW Awaken deck. White gives you removal to kill problem creatures while blue bounces and taps creatures down. The archetype definitely seems possible in draft, but might be a little harder to pull off in sealed. You can splash a third color for other Awaken spells if you want, but white is going to be your go to color. Bringing back a Sheer Drop or Planar Outburst from your graveyard is pure value, and then giving any land creatures you have flying is going to bring games to an end quickly. It’s not a card you want to build around, but if you have 3-4 playable Awaken cards in your pool I think Tidecaller should be an auto include. While not an Awaken spell, Adverse Conditions is another card that we’d usually glance over and only consider it as a 23rd card in our limited deck. In past sets this card has been something like Sleep (M13) that keeps a creature from untapping, but I think tapping down 2 creatures and adding a 1/1 creature to the battlefield can be a better tempo swing. You could take out their last two blockers for an alpha strike, ramp into something the following turn, or tap down creatures prior to attacking to save your life. This would supplement other cards in a UW Awaken deck well, and the Scion would work well ramping into an awakening cost. Not bad. Since we’re on colorless “devoid” cards now, might as well continue with the rest of them. 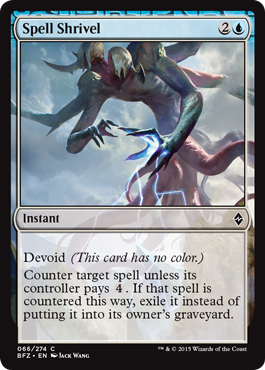 Counterspells should be a little bit better in this format since we’re looking at keeping 5 mana and bigger spells from resolving later on in the game, but you should also consider using this as a way to put cards in exile in order so you can process them with any Eldrazi Processors you have. If you can’t take advantage of their abilities then you’re losing out, so it’s important to have something they can ingest. I don’t think a card like this will be a high pick but if you need the synergy pick it up. Ruination Guide will help you with that processing strategy by using his Ingest ability to exile some cards from your opponent’s library, but as you can see what makes him better in limited is his ability to give your other Eldrazi a power boost. Suddenly making a handful of Scions 2/1 creatures can really screw up your opponent’s math when it comes to attacking or blocking. I think there are going to be enough colors creatures in limited to qualify Ruination Guide as a high pick in draft. Pick it up as soon as you see it. If your rare is junk grab him first. I especially like him in a UG Eldrazi ramp deck with From Beyond. Spit out a 2/1 Scion ramp creature every upkeep! 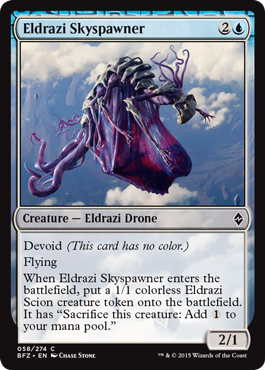 Blue has some really good Drones, heck, it might be the BEST color for Eldrazi cards period. A 2/1 flyer plus a 1/1 ramp creature? 3 mana, 3 power . . . why not. This guy is going to be good regardless of the type of deck he’s in. Not bad as an early pick in draft if you’re in blue either. I see it in UW flyers and UG ramp right off the bat, but don’t stop there. It will be an essential part of many decks running blue. Not as good as the Skyspawn, but 4 mana for 3 power with ramp works. Whenever you can get 2 bodies with 1 card it’s a bonus. You’ll need guys like this to fill your curve, and I believe that 3 and 4 drops are going to be pretty important in this format. Going from 4 mana to 6 mana on turn 5 can be pretty big. If you played Skyspawn you could play an even bigger creature the following turn. Consider him as one of your top 20 cards in your limited deck. I’m not really sure if Reclaimer is good or bad. On one hand you can get back some removal you used if your opponent has cards in exile you can put into their graveyard, but at the same time you’re paying 5 mana for a 2/5 that can have a conditional effect if you don’t have Ingesters doing damage. I think I might consider this as my 22nd or 23rd card in my limited deck if I had great removal cards in my deck such as Planar Outburst or Ruinous Path, but otherwise I’d leave him in my sideboard. Murk Strider is overall a better processor than the Reclaimer. It’s easier to cast at 4 mana, has higher power, and the bounce effect is more useful I think. Getting that card from exile on turn 4 might be a little tough though, so be sure to use cards like Horribly Awry or Mist Intruder in order to get that pile of exiled cards growing. Just as with the Reclaimer, his ability can be rather conditional if you don’t have the synergy to take advantage of it, but in Strider’s case his power and casting cost make him slight better. He’s a bit more aggressive while the Reclaimer fits better in more controlling decks. Oracle of Dust well . . . leaves Reclaimer and Strider in its dust. It has the same power as the Strider and same toughness as the Reclaimer, and he’s fine waiting until a card shows up in exile to use his ability. It will depend on the type of deck you’re using, but even being able to “loot” (draw and discard a card) a few times a game makes Oracle of Dust worth playing. I would take him higher in draft than both of the previously mentioned processors, and being able to play him outside of an Eldrazi deck with Ingest creatures makes him worth having in both your limited decks. Solid card with a good ability and body. Cryptic Cruiser is another processor worth playing. Like the Oracle, it’s worth playing just as itself (a 3/3 for 4 mana) and waiting for a card to show up in exile to use the ability. You’ll definitely want a few creatures with Ingest to fuel this ability efficiently though. Benthic Infiltrator seems like he’d be best friends with the Cruiser. 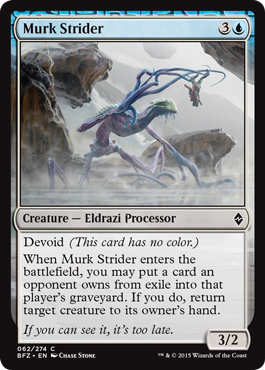 The Infiltrator will give you a steady stream of exiled cards to fuel Cruiser’s ability, but also consider Mist Intruder as an Ingest source. He’ll be a decent card in any blue deck you play, but he’ll be even better if you can use his ability at will. Consider this if you’re building an aggressive Blue/X Eldrazi deck. Keep in mind there will probably be two types of Eldrazi decks in this format. The Ingest/Process type and the Ramp type playing big creatures. He fits in the former. 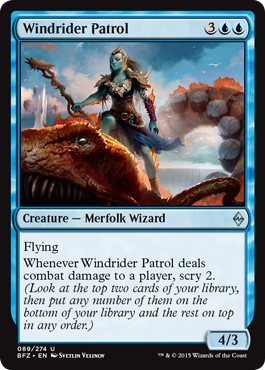 Moving along to the remainder of the blue cards, Windrider Patrol is going to be freakin amazing in limited. A 4/3 flyer is not going to be blocked by many creatures (at least not by any creature that will live to tell about it), and whenever it deals damage you get to scry 2. It’s no Prognostic Sphinx (THS) but having this type of ability on an uncommon is unheard of, especially at such an economical casting cost. Sorting out your lands, grabbing removal for next turn . . . I mean some of you might remember how good Prognostic Sphinx was during his short stint in standard. Scry is downright nasty in control decks. He gets top billing no matter what kind of blue deck you’re playing. Might even be first pick material in draft. 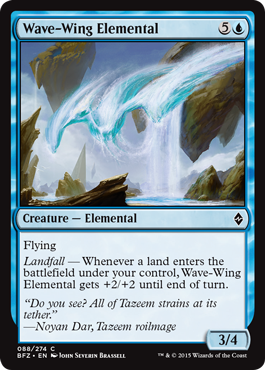 Wave-Wing Elemental is another sweet flyer in blue. 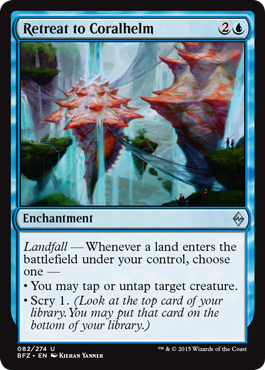 Sure it costs 6 mana, but like I said about Landfall earlier, you’re going to be drawing a lot of land in a deck that is made up of around 40% land. Attacking as a 5/6 flyer on offense is amazing, but even on your turn a 3/4 flyer is nothing to scoff at. The fact that this is at common means that you could easily fit 2 into your deck, and even splash it if you need the power. I like it in UW flyers of course, but it would be pretty good in UG ramp with cards that put lands into play or grab them from your library like Natural Connection. Not bad for a common and a possible finisher. The second card of the Landfall enchantment cycle is almost as good as the white version. While I’d much rather have creatures and power in limited, tapping down a creature or scrying can be equally as effective. In a blue/x tempo deck like the UW Awaken deck I talked about it can give you the time you need to lock down your opponent and overwhelm them. UB Awaken might not be bad either consider the larger amount of removal available in black. It’s an all around good card in limited but keep in mind that it’s much better if you have a deck that supports it. This means fast/big creatures to attack with to utilize the tempo or powerful spells to scry to. You can definitely get creative with it though, using the untap ability to ramp with green and through out your finisher a turn or two earlier than you originally could of. 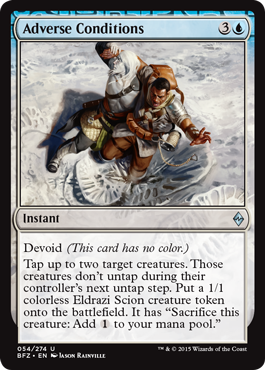 Anticipate – grabbing a good card and filtering out the rest seemed to work well in DTK, but it’s not for every deck. Benthic Infiltrator – if you need a card that’s going to give you a stack of exiled cards to process it doesn’t get better than him and with 4 toughness he can block well too. Cloud Manta – another roleplayer that fits well on your curve in a blue deck, has evasion, and a decent power level. Coralhelm Guide – It’s an Ally which is a plus, but it can be good in just about any deck if you’re playing with some hitters that keep getting chump blocked. Drawback is 1 toughness. Horribly Awry – good for getting cards exiled for processors, but horrible late game when you need to stop their Ulamog from being cast. Mist Intruder – flyer, ingest to give you exiled cards for processors, only 2 mana . . . what’s not to like? Oh, it has 1 power. This card might get in a few points of damage early but will be blocked by any other flyer a few turns later. So yeah, as I said, there are a lot of cool abilities but there’s a lot of text to read through saying that these abilities are conditional. After 2 colors I can see the the Blue/White Awaken deck becoming a thing, and there are definitely enough cards for UW Tempo/Flyers. 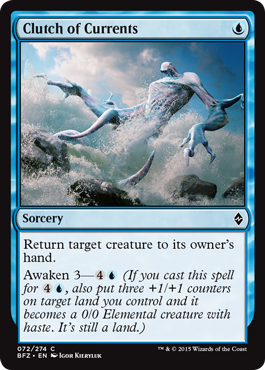 Blue is also chock full of Eldrazi processors with some interesting abilities and some with evasion which will become more apparent later on as we look into the other colors (and those cards without colors). Did my thoughts line up with yours on blue? If not, add in your two cents down below in the comments section. I’ll be trying to get out black on Wednesday so be sure to check back whenever you can to get ready for BFZ limited and the pre-release! Thanks for reading.